September 21, 2012  Just a few months ago, most observers believed Republicans had a pretty decent chance to take control of the U.S. Senate. Now, that doesn't seem as likely. September 20, 2012  Mitt Romney's campaign is calling President Obama a redistributionist as a way to change the "47 percent" discussion. But in fact, taking from some and giving to others is a concept long enshrined in the nation's tax code. September 19, 2012  One thing all parties seem to agree on in this latest campaign controversy is that the proportion of households not paying any federal income taxes has indeed grown larger in recent years. One key factor has been a federal subsidy for low-wage workers known as the Earned Income Tax Credit. September 16, 2012  A mountain of unfinished business has piled up before lawmakers, but members of both parties are hoping to put it off until after the November election. Whichever party takes power then will have an advantage at the negotiating table. September 14, 2012  Everyone is blaming everyone else for sequestration and the massive defense cuts it entails. Mitt Romney says it was President Obama's brainchild — that's not true. Paul Ryan, in fact, voted for it and praised it at the time. September 7, 2012  President Obama accepted his party's nomination for a second term at the Democratic National Convention in Charlotte, N.C., Thursday night. Due to a change in venue for Obama's speech, as many as 60,000 holders of community credentials were not allowed inside the arena. Instead, they had to watch the speech on TV. September 6, 2012  Michelle Obama spoke at the Democratic National Convention on Tuesday. On Wednesday, she made the rounds in Charlotte, N.C. talking to groups of delegates. The way to fight back, she said, was for delegates to step up their person-to-person ground game aimed at winning more votes for her husband. September 5, 2012  First Lady Michelle Obama gave a speech to the Democratic National Convention on Tuesday that was met by thunderous applause, emotional tears, and rave reviews. 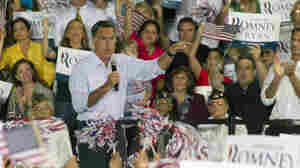 September 4, 2012  Hispanics were a major focus of the program at the Republican National Convention in Tampa. Democrats, beginning their convention in Charlotte, N.C., are hoping to capitalize on their current advantage with Hispanic voters. August 2, 2012  With summer vacation beckoning on Friday, Congress tried to finish up some business on farm programs and other pressing matters — generally by delaying larger decisions until later. August 2, 2012  It was just a year ago that the House rejected a deal with President Obama and threatened to allow the U.S. to default on debt obligations coming due. The Tea Party refusal to raise the debt ceiling led to a downgrade in U.S. credit and a selloff in the markets. NPR's David Welna reports on what's changed since then and what hasn't. 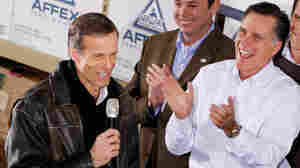 Does Sen. Thune Have The Right Stuff For Romney? July 29, 2012  As Mitt Romney's campaign zeroes in on a No. 2 for the Republican presidential ticket, South Dakota Sen. John Thune could be a safe option. He's an experienced legislator with conservative credentials. Yet, like many of his fellow hopefuls, he's coy when it comes to VP talk. July 28, 2012  There have been expressions of sorrow from the nation's political leaders over the shootings in Colorado, but no one's making any attempt at rewriting laws to head off another massacre. The National Rifle Association is widely considered the reason why, but is its hold over Washington real or perceived? July 25, 2012  The Senate is set to vote on Democratic and Republican plans to extend the Bush-era tax cuts. Democrats want to limit the breaks to those making less than $250,000 a year. Republicans want even the rich to keep the lower rates.